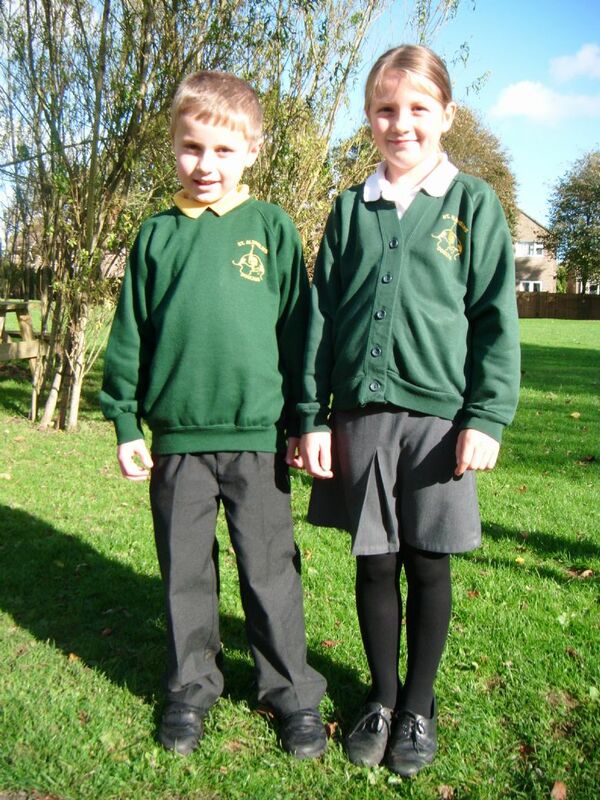 Our school uniform is based on our school colours of gold and bottle green. We have a summer and winter uniform, which is available to purchase from the school. It is also possible to buy 'second-hand' items from our 'School Uniform thrift store'. plain black shoes, suitable for children to move safely and comfortably around the school site. Leggings, skinny jeans and jean type trousers are not school trousers. Skirts should ideally be to the knee. Short skirts are not appropriate for young children to be wearing in a primary school environment. If parents of older children struggle to find woollen tights to fit their child, thick opaque tights can be worn if there is no alternative. The Summer dress is green and white, checked or striped. In winter, children who wish to wear boots may do so at playtimes, but must bring in a change of suitable shoes to wear in class. Children may also choose to wear a bottle green fleece or jacket, both with school logo, for outside learning and playtimes. Trainers are not school uniform, except when being worn for PE. It is important that your child is dressed appropriately for the time of year: Doulting has its own micro-climate, and it is often several degrees cooler outside than it is in Shepton. After a break or playtime, we remind children of the need to be ready to learn when they enter the classroom; this includes having shirts tucked in, jumpers on and hands clean. For health and safety, as well as hygiene, reasons, hair that is shoulder length or longer must be tied back. Children should not wear jewellery, 'fashion' hair accessories, sweat bands and/or nail varnish. Plain studs may be worn, but must be removed or covered with micro-pore tape for PE lessons. Children in infant and junior classes need daps (plimsolls), plain white t-shirt, and plain black shorts. For outdoor games lessons during the autumn and winter months, junior children also need to have warm layers: a plain tracksuit or plain black/bottle green/ grey jogger bottoms and sweatshirt; trainers. To help protect books being carried to and from school each day, we very much encourage children to have a book bag. These are available to purchase, at a very reasonable cost, from the school uniform shop. We have two styles available: standard 'briefcase' style with single carry handle, and 'messenger bag' style with cross-body strap.